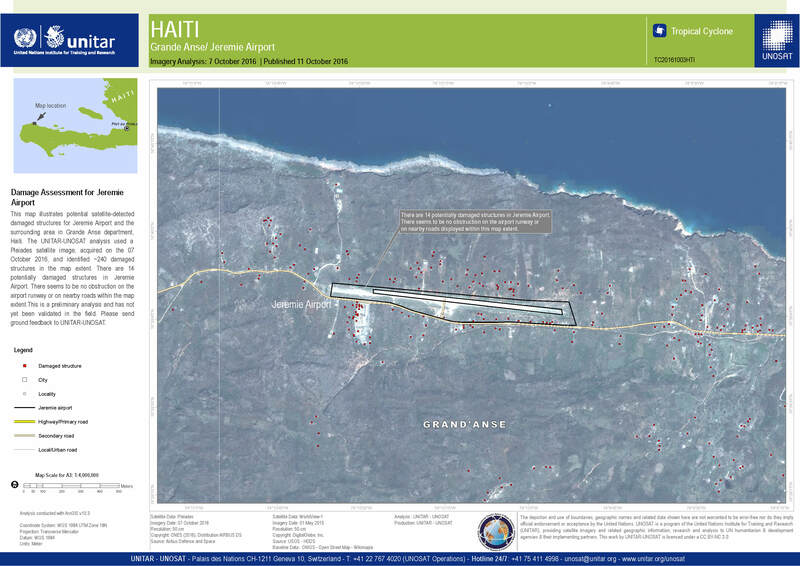 This map illustrates potential satellite-detected damaged structures for Jeremie Airport and the surrounding area in Grande Anse department, Haiti. The UNITAR-UNOSAT analysis used a Pleiades satellite image, acquired on the 07 October 2016, and identified ~240 damaged structures in the map extent. There are 14 potentially damaged structures in Jeremie Airport. There seems to be no obstruction on the airport runway or on nearby roads within the map extent.This is a preliminary analysis and has not yet been validated in the field. Please send ground feedback to UNITAR-UNOSAT.